She Loves is a magazine, a conference, a group of friends who love to express themselves online – and much more. And later this week (May 1 – 3) you’ll have the perfect opportunity to find out something about that ‘much more,’ during the She Loves Women’s Conference at Relate Church in Surrey. 2. They are a magazine, and more. To quote them: “Yes, we call ourselves a magazine, but now that we’re almost two years old, we’ve discovered we are more than that: We’re a global community of women – a Sisterhood – who want to know and experience freedom, justice and transformation, for ourselves and others. 3. They’re based here, but they’re very internationally-minded. No doubt there are many reasons for that, but probably the key one is the vision of founder/editor-in-chief Idelette McVicker. (born in South Africa, now living in Metro Vancouver). Skim the contributors page and you’ll see they’re from all over North America, and beyond. 4. Members of the She Loves network (team? club? collective?) are on a journey, and it’s not one I saw coming in earlier incarnations of Relate Church. There is a lot visible on the surface with She Loves, but there is clearly also a lot going on behind the scenes. One speaker who can shed some light on the past of that journey as well the present and future, is Sarah Bessey, whose newly-released Jesus Feminist has done very well critically and in terms of sales. While she now lives and worships in Abbotsford, Sarah has had close ties to Relate for years. And she knows the milieu well; she links her feminist beliefs with growing up in the charismatic community. I’ve collected literature since I was a teenager, and when I became a Christian in my twenties I wanted to know who the great Christian writers were, and why I hadn’t heard more about them. Many told about Lewis, Tolkien and Williams (‘the holy trio’ to some), with many throwing in George MacDonald as well. Then Dostoevsky, Mauriac, Endo, Solzhenytsin and many others. But there still didn’t seem to be many North Americans – some good Catholics (O’Connor, Percy, Powers), but fewer Protestants (Buechner, Updike). Then there was the Left Behind series . . . All impressionistic, of course, but things were not entirely rosy. Arts are flourishing in the church these days, thank God. But while many are still learning the ropes, we still have relatively few tried and trusted guides. Marilynne Robinson is one of those guides, comfortable in the world of ideas, a joy to read in fictional form (with a Pulitzer Prize for Gilead) and spiritually astute. An evening with Marilynne Robinson at Regent College this Saturday provides the perfect opportunity to hear from her at length. Following her talk, Regent prof Iwan Russell-Jones will interview her, followed by discussion and questions. This talk is part of the 17th Dietrich Bonhoeffer Lectures from May 1 – 3, on Christian Humanism in a World Come of Age. Robinson will participate in a couple of panels which will no doubt also be very worthwhile. Not all churches even have libraries any more, but it is good to see that the Church Library Association of BC will be putting on a series of ‘Passing it on’ workshops this Saturday (May 3) at Richmond Faith Fellowship. In one workshop, Ed Knorr “will discuss how to choose books and DVDs for various age groups amidst shrinking budgets and increasing competition from the internet.” A computer science instructor by profession, Ed has been managing the Johnston Heights Church library in Surrey for 24 years.The library has 7,000 items and there is a team of seven volunteers. The Eastside Story Guild knows how to tell a Bible story so it will stick with the listener. At one time, no doubt, parents and others who felt obliged to watched their (or their neighbours’) little Johnny and Suzy perform, came with low expectations. Year after year, word of mouth has spread the good news of Eastside Story Guild, so there won’t be any empty seats during performances of So High You Can’t Get Over It this weekend. “The idea began in 1998, when Tama Ward Balisky went to a performing arts production that had been working with at-risk children in the neighbourhood. Balisky, then a pastor at Grandview Calvary, remembers the stage, lighting, effects and acting all being fantastic. “’Coming from a Christian perspective you could set kids up for failure with that kind of storyline,’ she said. 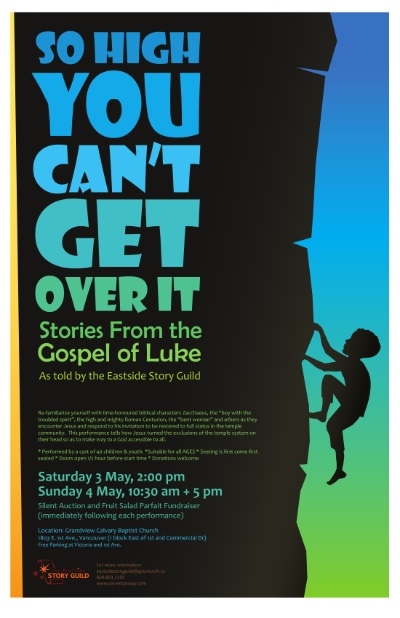 This year the Eastside Story Guild is telling ‘Stories from the Gospel of Luke.’ I’ve yet to see them perform, but I’ve heard nothing but good things. And it’s not too late to attend the Regent Pastors Conference next week (May 6 – 9). True, pre-registration is closed, but you can just walk in any day. Hosted by Ross Hastings, featured speakers are Mark Buchanan, Mariam Kamell and Rikk Watts, with other special guests. Purpose: ‘We want to help pastors reframe the call to discipleship so that formation and transformation become an outflow of our participation in the triune God, producing an attractive, vivid and effective pattern of faithfulness that reflects his desire for us to be truly human persons, ‘fully alive,’ bearers of the beauty of his holiness.